Brilliant color, same easy care! Radcor cv. Rainbow Knock Out® bears five-petaled, 2 inch diameter deep coral-pink flowers with a sunny yellow center. 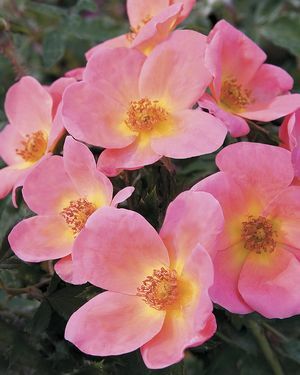 And its even more prolific and disease resistant than other Knock Out® roses–fully resistant to black spot, powdery mildew and rust. Orange-pink. Deep coral pink with yellow center. None / no fragrance. 5 to 6 petals. Average diameter 2″. Medium, single (4-8 petals) bloom form. Continuous (perpetual) bloom throughout the season. Pointed buds. Bushy, compact. Semi-glossy, dark green foliage.